When it comes to classic music, you can’t ignore Doo Wop. 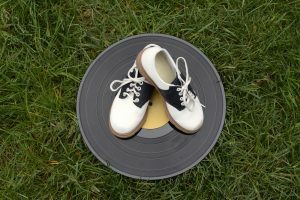 Its prevalence is tangible, and many modern music styles have roots in Doo Wop. Let’s jump in and dig a little deeper into this notable music genre. This is your guide all about Doo Wop. Doo Wop is an evolution of jazz and blues, known for its vocal group harmony. It’s characterized by simple syllables, beats, and lyrics. Doo Wop often features both a cappella vocal harmonies and full swing-like beats throughout a song. It is also iconic for using the off-beat to keep time. Vocals tend to follow a “top and bottom” format where a high tenor sings the lead and a bass singer recites lyrics in the middle of the song. In addition to harmony vocals, typical instruments in Doo Wop include double bass, electric guitar, saxophone, drums, and piano. Doo Wop began in the 1940s. It was developed in African-American communities along the East Coast, stretching from Philadelphia to New York City and heading west into Cincinnati and Detroit. As it grew and spread, it was picked up and influenced by other cultures, including Italian-Americans and Latin-Americans. Doo Wop reached mainstream popularity in the 1950s and early 1960s. Its influence continued throughout soul, pop, and rock groups of the 1960s. Doo Wop has seen revivals at various times in the 1970s, 1980s, and 1990s and laid the foundation for R&B and other musical innovations. The list of Doo Wop groups is seemingly endless. These are just a few groups to make a difference, both in the beginning and during later revivals. The Mills Brothers began as a barbershop quartet. Their sound fused jazz and traditional pop and they often used vocal harmonies classic to the Doo Wop genre. They created more than 2,000 recordings, which sold more than 50 million copies. The group has three dozen gold records to their name and were inducted into the Vocal Group Hall of Fame in 1998. The Ink Spots gained international fame in the 1930s and 1940s. The ballad style introduced to the group by lead singer Bill Kenny, often called the “Godfather of Doo Wop”, influenced their unique style. The group’s style had a great influence on the Doo Wop, R&B, and Rock & Roll genres. In 1989, The Ink Spots earned their place in the Rock and Roll Hall of Fame. The Platters were one of the most successful vocal groups of the early Rock & Roll era. The group often used several Doo Wop techniques. They were popular during the 1950s and 1960s, and contributed to the Doo Wop revival in the 1970s. Between 1955 and 1967, 40 of their singles charted on the Billboard Hot 100 – including four #1 hits. In 1990, the group was inducted into the Rock and Roll Hall of Fame. They entered into the Vocal Group Hall of Fame in 1998. Although The Temptations are known more for their R&B and soul, their music and vocal harmonies often show a Doo Wop influence. They rose to fame in the 1960s and 1970s, and continue to perform with original member Otis Williams in the lineup. With over tens of millions of albums sold, The Temptations are one of the most successful groups in music history. They’ve earned several Grammy Awards and received the Grammy Lifetime Achievement Award in 2013. Doo Wop is a soulful music genre that has evolved into a common vocal technique used by several singers. In the Spring, Summer, and Fall, AMT celebrates this music style with our Doo Wop Cavalcade. These shows feature singers and groups who use the pure vocal harmonies iconic to Doo Wop. Sing along to your favorites and walk away with unforgettable musical memories! Call us at (800) 648-4102 and grab your tickets to one of our upcoming Doo Wop Cavalcade shows!